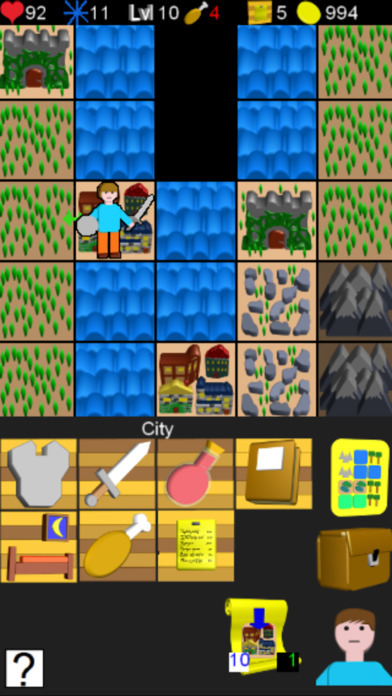 Xploquest is a wonderfully fun and well developed retro RPG where you travel across the land finding 10 keys to unlock the tower levels. The focus is on exploring and developing your character. There are interesting repeatable quests – battles and message delivery – which earn great amounts of cash and experience. There are different terrain types that you’ll need to skill up to traverse, and towns, towers and dungeons everywhere. The website has instructions in French and English, and it’s worthwhile going there to ensure that you’ve grasped the basics. Though it’s very simple!